Telestia is an online distance learning programme for fashion and clothing skills developed by SITAM-AB. Telestia was developed by the Fashion School SITAM-AB in Greece, which provides training courses, methodologies and unique work tools for fashion and clothing. SITAM-AB School of Fashion Design and Applied Arts was founded in 1970 in Thessaloniki, Greece. SITAM-AB has forged strong links with the field of Garment Manufacture in the North and South of Greece and has grown with the industry. It is one of the longest running and most successful training institutions in Greece in the field of Fashion and Design, always showing vision and innovation in its training methods & courses, both in terms of fashion, design and technology. In the '80s SITAM-AB developed a wide range of bibliography based on the patented AB methods and tools for the teaching and practice of Pattern Making, Grading and Fashion Drawing. These methods were widely successful throughout Greece for their technical and pedagogical advantages. They were eventually translated in other languages and are now widely available at www.fashionbooksonline.com. In the '90s it developed a wide international network forging links and collaborations within and outside Europe. It developed and participated in many European co-funded projects. Some of these projects involved the exchange of students and tutors, others the development of innovative learning materials. SITAM-AB transferred its learning materials into digital content using state-of-the-art technology and multimedia in a pedagogically effective way. It, therefore, pioneered in the development of eLearning training courses, Distance-Learning and blended learning materials for both classroom environments as well as for tutor-supported self learning. In 2004 SITAM-AB launched the eTelestia eLearning portal which offers Online Courses for Self Learning with Tutor Support, in 6 languages. These courses are based on the original training materials of SITAM-AB, using its patented methodology and an innovative pedagogical approach in the use of multimedia. The eTelestia online courses and methodology have been validated for their effectiveness by the numerous European Project Partners and their students, and are continually being improved and further developed. New modules and courses are being continually developed, as well as opportunities for international accreditation of the eTelestia qualifications. 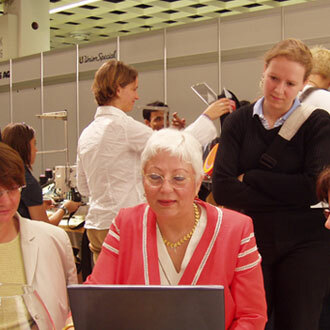 As part of its European and international profile, SITAM-AB has participated with its students in international fashion and design exhibitions such as IGEDO in Dusseldorf, Herrenmode in Koln, Euromode - Textilia and Furnidec in Thessaloniki, various European Biennale, the international eLearning conference in Karlsruhe. SITAM-AB students have participated in the International Young Designers Fashion Shows in England (Kent Institute of Art and Design) and Holland (Katholike University in Niechmegen) with the aim of promoting creativity and innovation in Design and giving opportunities to young graduates. Read more about Sitam-AB: www.sitam-ab.com.